Dog harnesses were originally designed for pulling loads such as dog sledges, for attaching equipment or simply for displaying attention grabbing signs. Why then, in modern times, would a dog owner choose a harness instead of a collar for their dog? Modern day dog harnesses are practically all based on harnesses used in the equestrian world. Draft animals have been pulling heavy carts for years. It’s worth looking at the different options available and discussing which one is better for your dog. Neck and girth harnesses were brought to Europe from China over 2000 years ago. They were used by ancient civilizations for draft animals, and also used in battle by the cavalry forces of that era. Breast strap harnesses, also known as chest harnesses, dating back to Roman times, were introduced because of the “choking” effect of neck and girth harnesses. The physical pressure that these applied to the respiratory system prevented draft animals from exerting themselves fully, so chest harnesses allowed animals more freedom to breathe, allowing them to work more efficiently. Full collar harnesses were designed and most commonly used in Europe for specific animals to pull heavy loads. This type of harness allowed the horse to use its full weight, resulting in a more ergonomic design than the breast strap harness. In ancient times, dog harnesses were developed mainly for dogs working in special deployment areas e.g. where strong-bodied dogs took an active part in combat, engaging in battle for both attack and defence. Dogs were also used for guard duties in war zones. With the onset of World War 1, service dogs began to be used as rescue and messenger dogs. As in other areas of life, technological advances prompted by conflict led to developments in other walks of life in subsequent times of peace. As an example, In 1849, during the American Gold Rush, dogs were used for pulling sledges in the same way as they’d pulled carts previously in battles, and after World War 1, the first guide dogs were used, using harnesses developed for wartime purposes, that still provide the freedom of movement for the dogs. The early twentieth century began to see further development of dog equipment and harnesses. Nowadays dog harnesses are used for a far wider range of purposes. Demands for new functions are continually emerging as dogs become more involved in a wider range of activities. Harnesses began to receive more recognition in the 1990’s as a result of campaigning by animal rights activists. A harness appears to be more comfortable, putting less stress on a dog’s neck than a collar. As one critic of dog collars said. “We call dogs ‘man’s best friend’, and then we drag them by their neck? It doesn’t make sense, and that’s one of the main reasons for the increasing popularity of dog harnesses. They are intuitively better for a dog’s general health. Both types of harness can include an additional saddle piece, with or without lining and they can have variable strap widths. Each of these versions is suitable for walking a dog on a leash. Harnesses are meant to be worn just for one or two hours a day, as well as on daily walks. Collar and hames harnesses are positioned between the neck and the shoulder joints. The strap surrounding the neck allows the animal to exert its pulling force optimally, on the whole area of the chest and spine. It is no coincidence that this type of harness is used for pulling sleds: it’s efficient and comfortable. ”Y” harnesses have been developed specifically for dogs, as a derivation of the collar and hames harnesses used for horses. The best-known examples are the dog sled harnesses perfected for pulling loads, which have developed into their current form over centuries, and have recently become well-known as everyday dog harnesses. Today, in addition to pulling sleds, Y-harnesses are used for weight pulling sports and for search dogs.All Y-harnesses have padding connected to the neck strap, extending under the belly, parallel to the spine. This padding, extending under the chest and the belly, can either be incorporated into the dog harness, or added later. Extensive padding can cause complications during street use, because the areas close to the ground, under the chest and the belly, are more prone to getting dirty, with mud sticking to them. Therefore, it’s practical to use removable padding; this improves the general comfort of the dog, as well as making it easier to remove for regular cleaning. In the version of Y-harnesses designed for pulling sleds, the leash is attached to the back one-third of the body of the dog. This is optimally located both in terms of comfort and for maximal pulling force. Wide straps dissipate the pressure applied to the dog’s body when pulling, and they help to align the body of the dog properly when led on a leash. For older dogs who have more restricted movements, extra padding on these wide straps makes harnesses even more comfortable and efficient. Y-Harness models suitable for everyday wear are available – the leash can be attached to the front of the harness to make handling easier, rather than to the back, as for pulling loads. The skills and ability of the dog handler need to be taken into consideration when choosing this type of harness: it can take time and practice to become proficient at working with a dog wearing one. The strength of the spine and chest muscles can be used to the fullest extent, thanks to the placement of the straps along the line where the shoulder muscles meet the neck. The dog can use its full weight to pull in an efficient, ergonomic manner. The harness can be combined with a saddle part, which allows the attachment of high visibility flashings as well as other accessories on the back and side of the dog. They can be fiddly to put on the dog: the adjustment of the buckles and side adjusters is complicated, especially if you are not familiar with the way they work. If incorrectly fitted, Y-harnesses can put pressure on the windpipe, as well as on the blood vessels of the neck. They cannot be used for guide dogs. Some dogs do not like straps touching their neckline. A different type of harness should be used in these cases. Inadequate lining on the straps used around the neck can cause unnecessary pulling and tugging. The whole harness has to be cleaned as chest pads are rarely detachable. The mantrailing/outdoor Y-harness sold by Julius-K9 (2017) has an elasticated leash holding anchor, which can extend by 2 centimeters. This has a bungee-type effect, preventing harsh pulling or tugging. When wearing this harness during a working session or an active walk this ensures optimum comfort for the working animal, as well as easing the impact on the hand and shoulder joints of the handler holding the leash. The earliest archaeological find of chest harnesses date back to the Bronze Age. Chest harnesses were traditionally used for horses and draft animals in eastern civilisations, whereas in western cultures full collar harnesses were more popular until more recently. 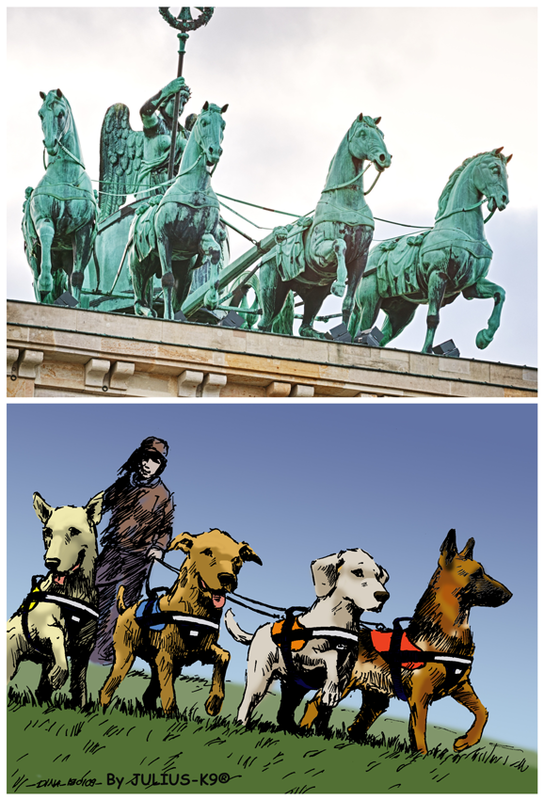 In Berlin, the well-known statues of horses pulling chariots on top of the Brandenburg Gate depict chest harnesses, but this monument was built in the 18th century. In earlier times, German horses would have been more likely to use full collar harnesses. A chest harness fits comfortably on the chest of a horse leaving the whole neck region uncovered and letting the legs to move free. The chest strap is the most common design of harness in Europe. 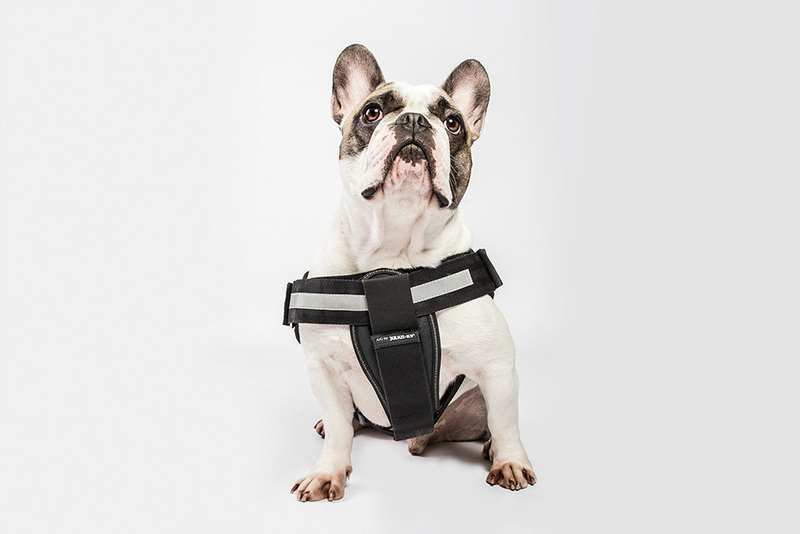 The “Norweger” and the “K9®” harness have a chest strap which connects the two shoulder joints horizontally at the level of the chest bone. ”IDC®” harnesses also have this feature, but because of their unique design, they merit a separate discussion. When choosing a dog harness, the anatomy of the dog and the activity to be undertaken should first be considered. You cannot choose a harness specific to a particular breed. As an example, the chest strap of the IDC® curves downwards in the direction of the sternum. This is not the case with the Norweager and K9® dog harnesses, meaning that the chest strap of these designs can sometimes slide up the neck of the dog, causing choking when the dog is being walked on a leash. For this reason, with short necked dog breeds, a chest lining or chest pad is recommended with a standard chest harness. The main priority for a chest harness is to protect the blood vessels of the neck and the respiratory system. Various paddings are used on the chest strap to ensure this happens effectively. With the K9® harnesses, for example, the chest strap rests on the sternum and is made from a rigid material which forms a hoop around the chest of the dog. This hoop prevents the shoulder joints from coming into contact with the chest strap when walking or trotting. The chest strap easily glides up in the direction of the neck when the dog is jumping or lifting its front legs. When choosing the correct harness for your dog, you should consult the manufacturer’s size selection and adjustment guide. If you think the chest strap might affect the dog’s movement when leaning forwards, then the IDC® dog harness with a curved chest strap might be a more suitable option. Do not be tempted to get a slightly larger harness for a dog that is still growing as the chest strap may be able to slide down over the dog’s front legs, allowing it to escape. A chest pad attached to a chest harness provides a useful way of making the harness more secure and harder to escape from. Do not restrict the free movement of the dog’s elbows by adjusting the straps too tightly. It’s safest to refer to the harness instructions for guidelines on fitting these harnesses correctly. Chest harnesses come with and without a saddle part. The saddle part prevents the carabiner (spring-loaded metal shackle) on the leash from rubbing on the dog’s back while walking. Julius K9® harnesses include a saddle part which has been manufactured in Europe and has undergone loading tests. Without a chest pad, the chest strap can slide up to the neck, putting a heavy burden on the front legs of the dog in weight pulling sports. If loosely fitted, the harness can get pulled over the head with the leash. Incorrect size selection or adjustment can cause the buckle to rub on the elbow of the dog. Options are limited for attachment of a torch. Smaller dogs may find the saddle part too rigid. Chest harnesses are not suitable for all varieties of dog, so cannot be used for load pulling sports. IDC® dog harnesses are available in two versions – those with a saddle part and those made only of straps. They are the first, and possibly the only, harnesses in the world to base the chest strap line on a mathematical calculation. This trigonometric calculation (2010) allows the chest strap of the harness to fit along the chest of the dog in a similar direction to the expected force when led on a leash, thus avoiding any burden on the neck region. They are available in two versions: with a saddle part or just with straps. The buckle of the belly strap is situated near the back, away from the elbow of the dog, ensuring that it does not interfere with movement, even when adjusted incorrectly. The chest strap leaves the neck line completely free. As with the Y-harness, the back of the dog’s neck is surrounded by the edging of the saddle part. The wide chest strap is a rigid structure, so it rests on the sternum, and as a result it does not move down the legs, therefore it gives maximal freedom of movement. Manufactured in Europe, made of components that have been tested and have undergone rigorous inspection. Torches and other accessories can be attached to the medium and bigger sizes of harness. Labels can be attached to the sides of the harnesses. If the wrong size of harness is used, the chest strap can slide down the front legs. The chest pad must be attached separately. The smallest sizes (3.5kg and below) have a more rigid design which can at first seem strange. However tests have shown that this does not affect the dog in any adverse way. 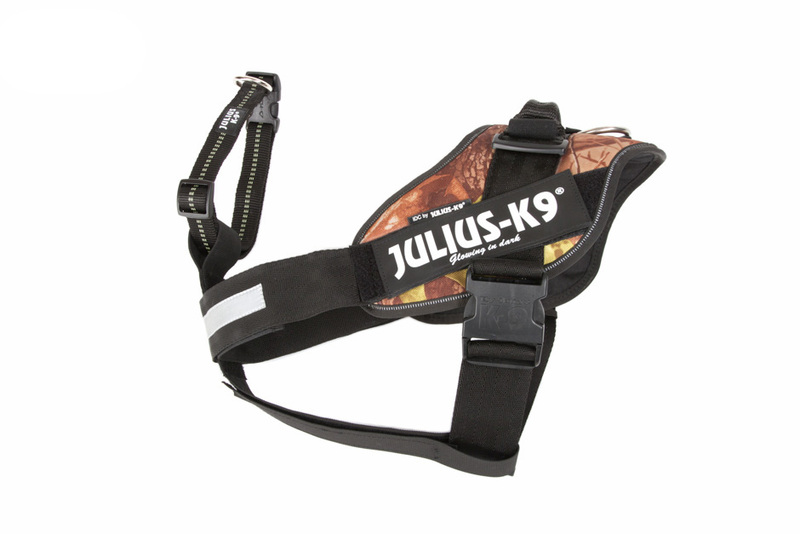 All Julius-K9 chest strap designs and sizes are available in versions that can include a saddle part. This attachment rests on the back, partially covering the dog’s sides. Technical equipment such as torches, cameras, bags and labels can be attached to this. This ensures that the equipment does not come into contact with the dog’s body, and therefore does not interfere with the animal’s movement. With the IDC® harness, the neck line of the saddle part corresponds with the neck straps of the Y-harnesses, assisting with the even distribution of pressure when leading a dog on a leash. The saddle part comes in a range of colours, including high visibility. It is water repellent on the outside, and made of breathable skin-friendly material (e.g. cotton) on the inside. Dog shelters prefer to use this type of harness on their dogs, as they find that insecure dogs are more confident when wearing them and being led on a leash. Choosing the right dog harness, and understanding how to adjust it properly, is very important. For further information on how to keep your dog safe and comfortable when out on walks, read the following article. Manufacturers use printed illustrations, photographs with written guidelines to demonstrate how to successfully fit and adjust their harnesses. Unfortunately it’s rare to be given a hands-on practical demonstration, although this would be the ideal answer. When choosing the correct harness size, it is best to use both the girth measurement and the weight of the dog. Manufacturers understandably place great emphasis on how to get these measurements right,as a properly fitted harness can prevent accidents. Choosing a larger harness for a dog to grow into should be avoided, as the chest strap can slip down over the dog’s front legs, allowing the dog to jump over it and escape. Improper fitting is the main reason why dogs are sometimes able to escape from a harness. The importance of getting a properly fitted harness cannot be stressed highly enough. The best answer is to choose a harness that’s easy to put on and take off, using only simple adjustments. It’s important to be familiar with these adjustments, in case a dog gets into difficulty and needs to be released quickly from the harness. Most harnesses come with clear guidelines from the manufacturers: Julius-K9 provides specific instructions for each of their products. For example, with Y-straps and IDC® chest pads, it’s advisable to attach a chest pad to the chest harness, as the chest pad itself can be opened independently. This means that when putting the harness on the dog, the chest pad does not have to be pulled over the dog’s legs, nor do the front legs need to be lifted. For anxious or lively dogs, it’s best to use a collar with the harness and to attach two leashes while you are setting the harness up. The Y-strap, which connects the belly strap and the chest strap to the collar, is designed to prevent dogs from escaping. Long bodied dogs, such as Daschunds, require a harness that allows the leash ring to sit on the middle third of the dog’s body. In contrast, short bodied ( “nose heavy”) dogs with wide girths, such as Pugs, should have the leash attached to the front third of the body. The width of the straps running in front of the chest and under the belly is crucial when it comes to pressure load, as a narrower strap puts a higher load on the body of the dog. The best answer is to use a 40 – 50mm strap for dogs weighing more than 18kgs. Even for dogs that weigh just a few kilograms, do not use straps that measure less than 14mm. A wide chest strap is the best way to ensure even load distribution. Taking accurate measurements of your dog is essential when choosing the correct harness. A poorly fitted chest harness can cause the chest strap to slip down the dog’s legs and if the harness is too loose, the dog will be able to escape. If the chest strap of the harness is choking the dog, or if the breathing is visibly impeded in any way, the size or fitting may be wrong. You can adjust the fitting of a harness by adding attachable chest pads to the chest strap. These pads can be washed separately, and come in various sizes. When using chest pads, as with the main harness, it’s important to select the correct size, especially if you plan to take the dog on active walks. For example, a chest pad covering the chest of an English Bulldog is likely to be too big for a Hungarian Pointer. A chest pad does not need to fully cover the front of a dog’s chest for normal activities. Over-sized chest pads can create an extra weight load for a dog, especially if they get wet. A pad lining the belly strap can be helpful for lifting a dog into a car, but it is prone to getting water logged and muddy when the dog is running free. With older dogs and dogs with restricted movement, it can be worth using a chest pad with an added handle. This can be useful for lifting the animal, and also for guiding it (for example, in crowds or beside busy traffic). Stressed or anxious dogs are better suited to a chest harness that can be put on in one move, by simply pulling it over the head. Y-harnesses are best avoided for these types of animals, as they need to be pulled over the dog’s legs, and they often have several buckles. To summarise, when choosing the ideal dog harness, you need to consider the body structure and shape of the individual dog, and choosing the correct design of chest pad is important for optimal comfort. Dogs are often seen as family members, and their health and safety is paramount. For this reason, it’s essential that manufacturers of dog harnesses use high quality materials that are guaranteed to be safe for human use. All materials imported into the EU require Reach certification which states that they do not contain any harmful or prohibited ingredients. It is imperative that the straps and linings used on dog harnesses have this certification, to avoid the risk of any potentially damaging components being absorbed into the animal through the skin via contact. 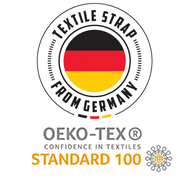 As an example, Oeko-tex Standard is an independent testing and certification system for textile products. Oeko-tex certified premium products offer reassurance that all the materials used in the manufacturing of Julius-K9 dog harnesses are completely safe. Straps and buckles from some other manufacturers may be sourced from outside the EU and may be made from recycled plastics which could contain harmful substances. These may also be inadequately made, with a poor load bearing capacity. Buyers should be wary of such products, as well as other counterfeit products: they often have fake certificates which be deceptive. Products manufactured in Europe should have all the necessary certificates to guarantee the calibre of the materials used to make the buckles and fasteners. High quality material is critically important for buckles, to ensure adequate load bearing capacity. If a harness is used for active exercise for several hours a day, it’s important to check for signs of rubbing on the dog’s body. This can be seen on the dog’s belly, neck region or armpits: anywhere that the harness comes into contact with the dog. If there is visible evidence of rubbing, the harness should be checked to ensure that it is adjusted correctly, as per the manufacturer’s instructions. To reduce the risk of any issues like this, the harness should be taken off after the daily walk. With short haired dogs, porous, mesh-lined materials tend to tug on the dog’s hairs, so a smooth cotton fabric may be more suitable. Cotton fabric is also easier to clean. Removable chest pads that get muddy should be washed more often than the rest of the harness. Machine washing and drying of any of the harness components is not recommended as it can affect the condition of the harness. Informed consumers are increasingly looking to purchase dog harnesses that have been subjected to load tests. All elements of the harness, including the stitching and the fasteners, should ideally be able to support three times the weight of the dog. All Julius-K9 products are tested to confirm that this is the case. It is dangerous to have a dog loose in the car: they can obstruct the driver’s vision, interfere physically with driving, or even escape into traffic through an open door or window, causing danger to themselves as well as to others. A well-designed dog harness can be an effective way of restraining a dog safely in a car. These harnesses can be secured by the seat belt itself, or by using safety buckles that have already been fitted in the car (e.g. to accommodate child safety seats). However, experts stress that even with the proper equipment, and with correct adjustments as required by current legislation, a harness alone is unlikely to be a life-saving piece of equipment in the event of accidents involving a frontal collision. The laws of physics prove that a car travelling at a speed of 50km/hr with a dog on board that weighs 10kg will result in a load force on the securing straps that’s ten times that of the weight of the dog. Even the best, strongest harnesses are unlikely to withstand this type of stress. As an example, the Julius-K9 harnesses can support three times the weight of a dog, which is ideal for normal daily use, but insufficient if used as dog restraint in a collision. For maximal security for your dog in the event of a collision, you should consider a securely fixed travelling box.